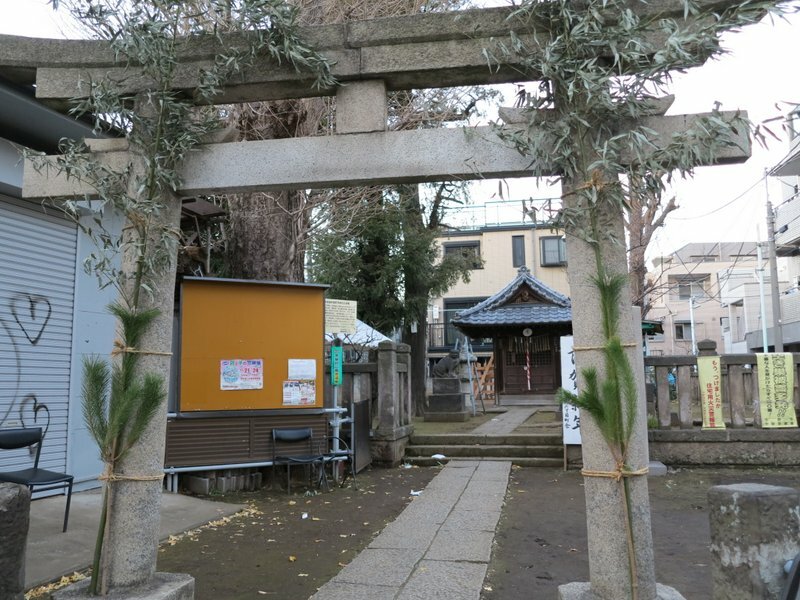 I love the simple pine and bamboo strapped to the entry gate of my local shrine. This is where we start the new year a few minutes past midnight with the neighbors drinking amezake and enjoying a small fire. Even the graffiti is cute. This new year, I will try to improve my photography, and seek a greater capacity for identifying the path of least resistance. Recently I brought 28 participants of the Dutch-Tokyo Still City workshop on “post-growth” urban life to Hamarikyu garden. This photo captures the simultaneity of activities inside and outside the garden: Edo-style pruning of pine trees, city dwellers enjoying traditional tea, port and luxury housing structures, even an incinerator chimney. I like how this pine tree is starting to fill out. It was hard pruned for winter, which allows more sunlight into the apartments. By summer it provided thick shade. Somehow this dubious security camera adds to the charm of this very orderly tree. Giving this pine tree a little off the top. Skilled pruning creates a living shape. I love how these traditional Japanese pines in Shinjuku Gyoen are so meticulously pruned. On this clear winter day, I love how you can see the pine needles accumulating against the brown lawn. Three ladders, red traffic safety cones, helmets, and no doubt some great pruning shears. 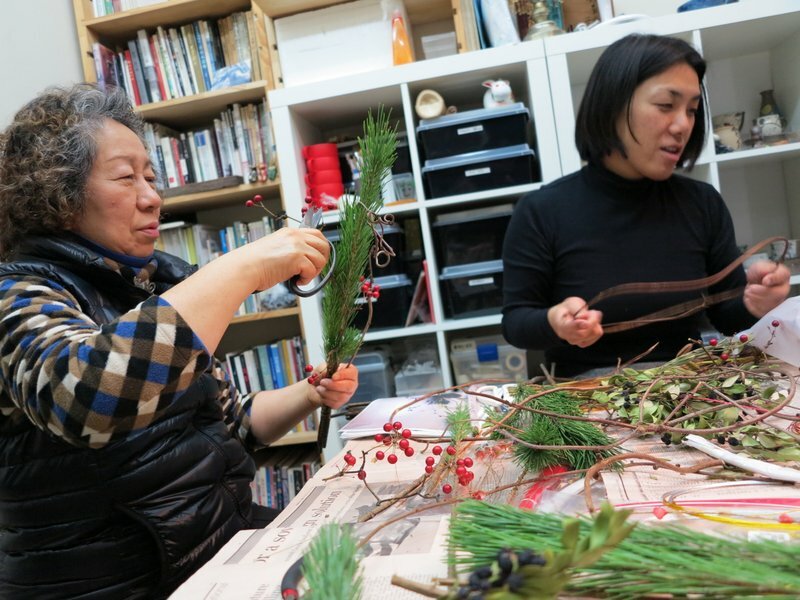 Fellow Shiho ceramic studio student Hagiwara-san organized a new year ornament or shimekazari workshop. It was so fun to work with beautiful, fresh materials, including several types of pine needles, pine cones and woody seed husks, Shinto folded paper, rice, ribbons and ropes, berries and rose hips, even dried chocolate cosmos and other leaves. In past years I’ve bought them from Muji or even the supermarket. It was fun how all of the hand-made shimekazaris turned out differently. Some had circular and oval bases made of twigs and bamboo, others were tied together in a bunch. I used wires to attach the mini pine cones and even a yuzu. 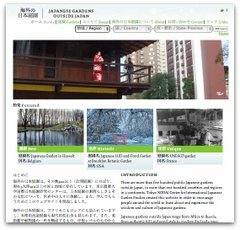 Hagiwara-san is also a loyal Tokyo Green Space reader. Thank you! My favorite Kichijoji plant store is moving soon. I have long admired the owner’s meticulous sidewalk garden, full of surprises. Here are perfect grapes, two of which we have just eaten. The garden is a long narrow strip with some more plants in a light well and the stairway to the lower level entrance. I like the mix of exotics like grapes, with traditional Japanese plants like pine and raphis palm, plus ferns, cactuses, and so many more plant types. The incredible variety of plants and the impeccable maintenance show off the gardener’s skills and wide interests. 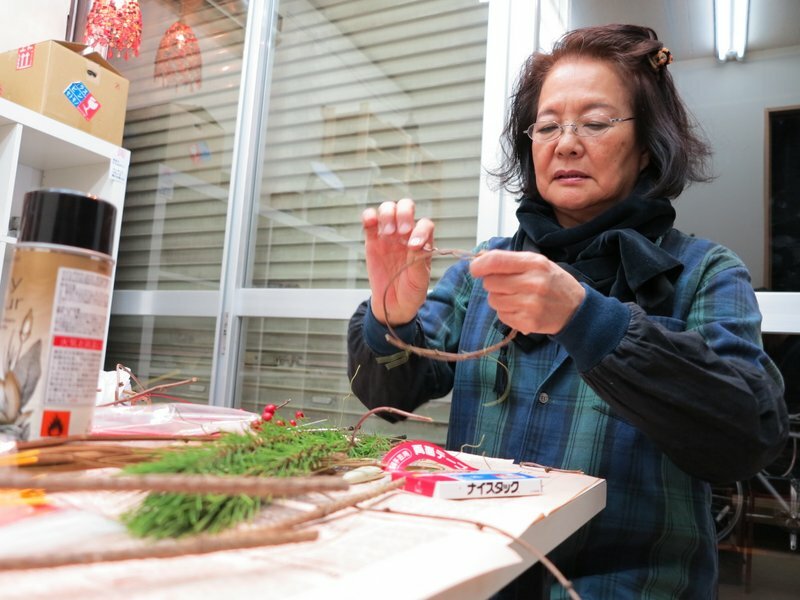 Tokyo residents and small businesses welcome the gods in temporary homes built of bamboo, pine, and plum blossoms. I love how the best ones are hand-crafted from pine, bamboo, and plum blossoms. They are intended to be temporary homes for the Shinto gods (kami, 神様). I like the idea that you can create a temporary house for the gods to visit at new year. The three heights of the kamomastu represent heaven, humanity, and earth- in descending order. 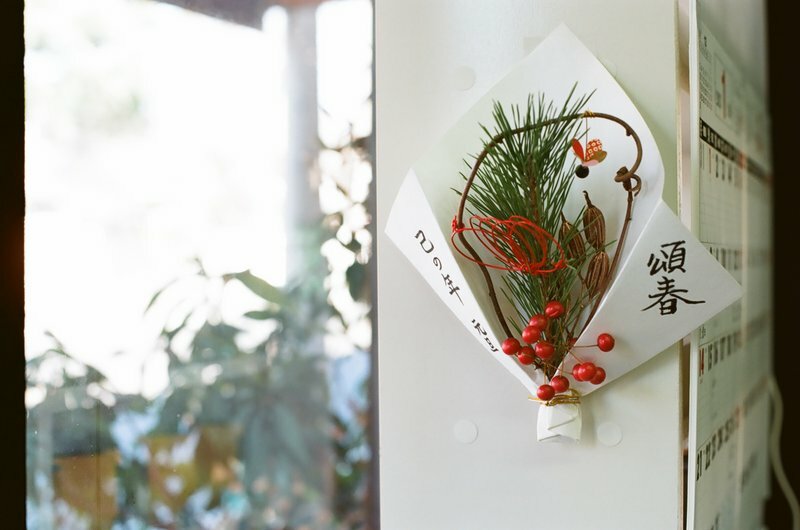 The shimekazari are smaller, with Shinto rope holding charms such as oranges, folded paper, rice straw, and ferns. 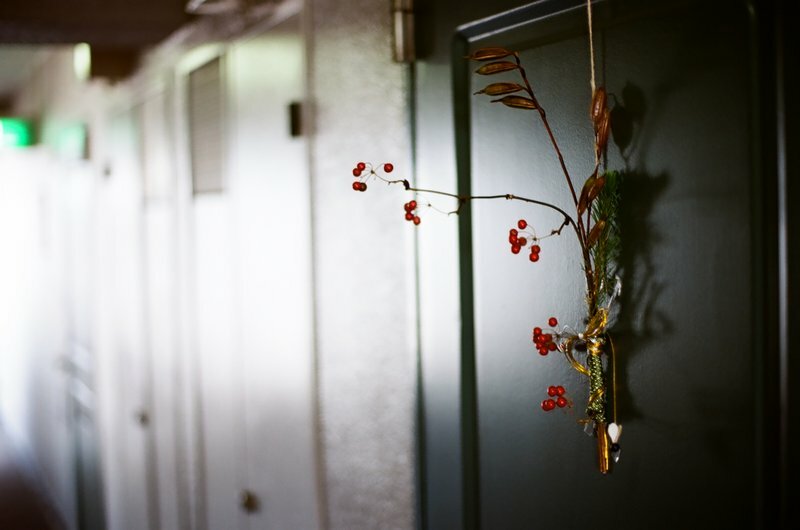 Shimekazari (標飾り) and Kadomatsu (門松) are traditional New Year’s ornaments placed on walls and on the sidewalks outside shops and homes. The city simultaneously empties of people and fills with physical connections to mountains and spirits. This year I took photos of the widest variety I could find in the areas I visit on typical days: on a car bumper, outside a sento, next to a wall of cigarette advertisements, on a busy boulevard, outside a barbershop, pachinko parlor, 24 hour convenience store, and a department store. After the holiday, these decorations should be burned at a shrine. By mid-January, they are already a faded memory.